Hamsters have become one of the most popular house pets in America due to their endearing appearance, their mostly sweet demeanor and their relative ease of care. First "discovered" in present day Syria in the 1830s, these little rodents are fairly easy to keep clean, increasing their appeal. While generally shy, they do have unique personalities and mannerisms and sometimes demonstrate that they like one person more than others. Observe the hamster with someone you know it likes, usually the person who handles it the most and meets little or no resistance when doing so. You then will have a reference point to compare its behavior against. Hamsters develop a preference for a person from being handled from their youth, and they develop a strong bond with that person. 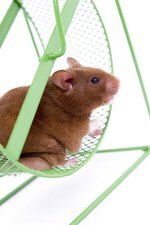 When such a person puts a hand in the cage and calls for the pet, the hamster is less likely to run away, and may even approach. You can safely say the hamster likes this person. Evaluate facial and bodily clues, through which hamsters show emotion. Watch the hamster closely when anyone puts a hand in the cage and calls for the hamster. If the hamster grimaces, flinches or raises its hand--which is a sign of preparing to fight--it probably does not like this person. If the hamster moves toward the person's hand, it likes him. Use the clues in the steps above to determine if the hamster likes you. Call the hamster by name; if it comes to you, it likes you. If it flinches or runs away, it does not. Test the level of the hamster's affection. Place it in a safe, contained area outside its cage. Call it and reach for it, with and then without a treat in your hand. Observe its response using the steps above to make a determination.